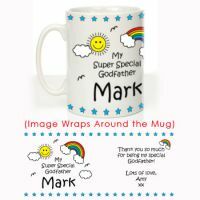 Personalised 'My Super Special Godfather' Christening Mug - colourful rainbow, sun and clouds design. 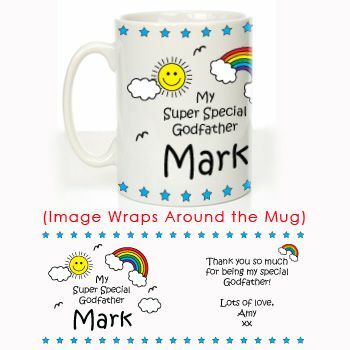 A unique Godparent Gift. Express UK Delivery - Special Delivery by Royal Mail despatched no later than next day (Max Delivery 48hrs). Saturday Special Delivery - Orders received before 12 noon can be despatched same day for guaranteed Royal Mail Saturday Delivery.